Absolute Beginner Here - Most Versatile 8-String Tuning? Topic: Absolute Beginner Here - Most Versatile 8-String Tuning? Hey all, first post here ... I am the proud owner of a new-to-me 25.5" scale 8-string lap steel. The fella who sold it to me has it tuned to an altered DE. To quote the seller, "The 1 is D, the 4 is G, the 5 is A, 1 again is D an octave up, 2 is E, 4 again is G, 5 A and bb4 is F. So I have it D, G, A, D, E, G, A, F. But again, you can do whatever you like. It will take open C, D or E in the current string gauges. Most people with 8 strings do open tuning plus two extra 3rds or 5ths on top. So in D that would be an extra F# and A on top of open D."
My music tastes truly run the gamut. Big ol' Deadhead (and middlin' Phishhead) here, raised on classic AOR (Dire Straits/Knopfler, Floyd, Stones, Bowie, Fleetwood Mac, Dylan, The Who, Bruce Hornsby, Buffett, CSN&Y, Byrds, Traffic, and Allmans off the top of my head), bluegrass/nu-grass, outlaw country, and Chicago blues, and rocksteady/roots reggae to a fun lesser extent. I guess my question is: In your opinion, which 8-string tuning (and any string recommendations if ya got 'em) do you all feel would allow me the greatest traction in getting this beauty under me and into practice in order to begin the pursuit of the kind of music that I like? I realize this is a broad question and it's gonna be a long road, but I'm cannot help but wonder if a baseline consensus will emerge given the description provided. You are going to get a lot of different answers to this one but for my money, a 6th tuning is hard to beat for versatility. My preference is A6 because (high to low E C# A F# E C# A F#), as a guitarist it makes more sense to me and I find it easy to relate to a D being on the 5th fret and a G on the 10th without thinking too much. You have a nice major chord on the top 3 strings and the relative minor on strings 234 which is handy for many styles (not all tunings allow you to play both full major and minor chords). It's great for blues (and rock) bacuuse if you go three frets up from the base key, you have notes of the pentatonic scale right across all strings (so if you're jamming the blues in A go to the 3rd fret). This is true of any 6th tuning of course. The only thing to watch out for is that if you try to strum across all strings, the F# makes it sound very Hawaiian (it's called the Hawaiian bomb) which probably isn't what you want if you're not playing old style country or hawaiian music! If you get 20 answers, you'll probably get at least 20 different suggestions but A6 has worked pretty well for me so far in every style I've tried. I agree on the 6th tuning. Rather than A6 I go for C6. Exactly the same intervals as the A6 but higher. Although I play A6 ( and now some C6! ) as a basic tuning, the list of material the OP wants to play would likely work well with a straight major key tuning, like A or E.
But as you point out, if you avoid the 6ths, you have a major tuning. I'm curious what other suggestion there are. Mike Neer has an 8 string E9 that is really interesting. I want to put it on one of my steels soon. My main tuning is E13/9 Morrell variation I use for main retro band, but I want to try mikes E9 for when I sit in with other more modern type groups. Will have to look it up, but it is possible. Also, just a plain open E or D with maybe a 7 th in there, have the bluesy root and 5th bottom as well. May be a bit easier to start with. E13 a bit much to start with perhaps, and there are dozens of versions. Mine is Hank Sr/Bob Wills type tuning. Older vibe. E9 or open E7 would be fun to get going with. Just a thought. Also, just a plain open E or D with maybe a 7 th in there,. Yeah, that makes sense too. An E13 of some sort could work...nothing is ideal for everything. Are you already a guitar player? The shortest route to making music is likely open E or in this case an extended open E. I think the most versatile tuning is Kayton Robert’s C6/A7 or LowA AC#EGACE. Sixth tunings (or 13 if you add a dom. 7th) are mostly considered the most "versatile" to cover everything. But then there have been specialty tunings beyond that. Even such a proponent of C6 such as Jerry Byrd invented a diatonic tuning, and there is the Leavitt tuning which facilitates playing Jazz standards in straight positions. I know these are not your interests necessarily. This is just to say that no one tuning has everything and that is why there are so many. It's an instrument of tunings. But if most only had one, it would be a sixth of some sort. However if I were doing a lot of rock and blues based music, I would look into what someone like David Lindley has been doing. I was looking at some of his tunings and they are mostly made up of root, third, and fifth. But then I think he plays 6 strings. One reason 8 strings came into popularity was to get some different scale degrees for more chordal possibilities. It's all good. Just be careful about which strings you are hitting--just part of playing the instrument. This comes up all the time and if you search the forum, you will be able to read many different arguments and explanations of the benefits of particular tunings. My best advice is, regardless of the tuning you put on your guitar, choose one tuning and really dig in to explore what that tuning has to offer. Your progress will go much faster this way then flitting from tuning to tuning - and I speak from hard-wrought personal experience. Work on blocking and playing in tune and see what your tuning can offer. 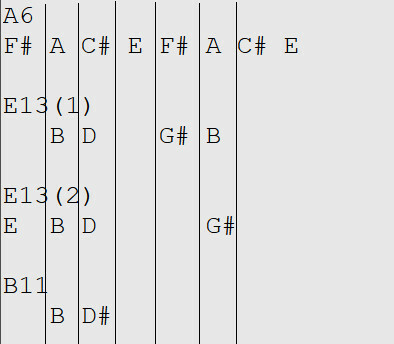 Later, you can branch out as no single tuning has it all but the core tunings (C6, A6, E13) have a lot. Thanks for all your replies! I'm overwhelmed with gratitude. As I suspected, and against hope, divergent pieces of advice have emerged however it seems that C6 and A6 or open E/E9/E13 is bubbling up to the top. It's a daunting decision because this is the tuning which will inform my first true impressions of the lap steel. I'd yet to play more than few notes before addressing damage to the head stock that occurred in shipping transit. My inquiry here on SGF will help me decide on a "final" setup before bring her home and beginning my education/practice in earnest. As Andy Volk stated, I simply need to get to it and not flit about between tunings hopefully for quite some time. And to answer Joe Kaufmann's question: I am not already a guitar player. Limited pronation has prevented that thus far ... hence the lap steel! The thing you may not be aware of at this point is that the same sting gauges can be used to get C6, A6, and an E13 with just a few twists of the tuners. So you are not locked into one choice there. Despite Andy Volk's good advice (and I agree with), unless you have remarkable restraint, you will likely do like most of us--dabble in several. It's irresistible! Almost a right of passage, in fact! I prefer A6th for the tone and the 5th on the top string, but if you intend to use tab music for learning then C6th with the 3rd on top has much more tab available. I agree with Andy, you're going to find a lot more tab in C6. I started a year ago and went through the same thing you are. I like the A6 sound but when you start looking around for paid or free tab, C6 will be a lot more common. I had the same question not so long ago. Jerry Byrd's course is absolutely answering me those questions. It's a path from simple to complex, both in tunings and technique. A6 (5th on top) retunes to C6 (3rd on top) quite easily, if you ever get that far in your steel playing. IMHO A6/C6 is the way to go. I would start with a standard C6 tuning. As has been mentioned here, there is much more instructional material available for C6 than any other tuning except possibly G.
Once you get a feel for the instrument (bar, grips, fingerpicks etc) You will be able to switch to whatever you prefer with minimal trouble. Obviously you are to use the same set for all these... so that's pretty versatile. I haven't tried this, someday maybe... right now I prefer E13 Leon, a great strum but harder to solo in. Hey everyone, thanks again so much for all your responses! I'm finally (dang work) ready to go ahead with the C6 tuning. The guitar's repairs have been completed and now it's just waiting on me for the restringing. Any additional advice on strings and gauges? Again, we're looking at a 25.5" scale with 3/8" spacing between strings. Photos forthcoming once I get 'er back home! I just got my first 8 string (well, D8, actually) and I’m using that Cashdollar tuning. I bought the SIT C6 8 string set and got a 12 for the high string. I've always preferred the A6th tuning with the fifth tone E on top. Mine is actually A13 because I tune the bottom string to G instead of F#. The 8 string C6th tuning is exactly the same, but 3 frets higher. There is more tab and instructional material available for C6th, but it is usually for 6 string lap steel with the 3rd tone E as the first string, so there won't be much tab for the 8 string C6th that has the fifth tone G as the first string. Not sure if Cindy Cashdollar has instructional material available or not, but if so, that would be good as long as the material is for the 8 string C6th. There is a lot of good advice here, but I am going out on a limb. There are no versatile steel guitar tunings, they are are all limited. Some players don't like the 6th sound, but then you don't have any minors. So, you have to fit the tuning to the sound or genre you are looking for. ... Some players don't like the 6th sound, but then you don't have any minors. So, you have to fit the tuning to the sound or genre you are looking for. Here's a big clue... you know you're getting good when you can avoid the 6-bombs. C6/A6 are not meant to be 'strum' tunings in my opinion. The hardest part of steel guitar is the notes you don't play. Bob Schaefer, the eharp player, wrote letters about his younger days playing steel professionally in A6 tuning. He said he didn’t realize you couldn’t strum a6th chord for he A major chord untill a piano and accordian player told him it was wrong. 1. With D A D F# A D I tune that high A up to a B. I know this is off the subject, I just love it, and you can really do a lot with it. I got the 6th tuning grips down really solid and fairly quickly, somehow. I rarely ever do a 6 bomb. I guess I'm just a prodigy. Except other than that, I'm not very good, lol. And I never attempt to strum it, other than the occasional "inside" strum. Of course I've been playing steel on dobros and Weissenborns for years, but never with a 6th tuning before taking up lap steel. I'm getting to where I can noodle out whatever melody I want by ear in whatever key in both low C6, A6 and Helms E6/E13 - they're all pretty much the same to me. It's 2-note harmony stuff mostly, not terribly sophisticated, but gratifying just the same. Already being decent at slants and bar dexterity coming from dobro helped a lot.